Kansas City is the third-largest city in the state of Kansas, the county seat of Wyandotte County, and the third-largest city of the Kansas City metropolitan area. It is part of a consolidated city-county government known as the "Unified Government". Wyandotte County also includes the independent cities of Bonner Springs and Edwardsville. As of the 2010 census, the city population was 145,786. It is situated at Kaw Point, which is the junction of the Missouri and Kansas rivers. It may be abbreviated as "KCK", but is often referred to as "KCK" to differentiate it from the bordering city of Kansas City, Missouri (which is often referred to as "KCMO"). Kansas City was formed in 1868 and incorporated in October 1872. The first city election was held October 22, 1872, by order of Judge Hiram Stevens of the Tenth Judicial District, and resulted in the election of Mayor James Boyle. The mayors of the city after its organization have been James Boyle, C. A. Eidemiller, A. S. Orbison, Eli Teed and Samuel McConnell. John Sheehan was appointed Marshal in 1875, by Mayor Eli Teed. He was also Chief of Police, having a force of five men. In June 1880, the Governor of Kansas proclaimed the city of Kansas City a city of the second class with the Mayor Samuel McConnell present. James E. Porter was Mayor in 1910. It was one of the nation's 100 largest cities for many US Census counts, from 1890 to 1960, including 1920, when it had over 100,000 residents for the first time. In 1997, voters approved a proposition to unify the city and county governments creating the Unified Government of Wyandotte County. According to the United States Census Bureau, the city has a total area of 128.38 square miles (332.50 km2), of which, 124.81 square miles (323.26 km2) is land and 3.57 square miles (9.25 km2) is water. Kansas City, Kansas, is organized into a system of neighborhoods, some with histories as independent cities or the sites of major events. Argentine, former home to the silver smelter for which it was named, consolidate with Kansas City in 1910. Armourdale, formerly a city, consolidated with the city of Kansas City in 1886. Armstrong, a town absorbed by Wyandotte. Bethel, a neighborhood generally along eith side of Leavenworth Rd., between 72nd and 77th Sts. I was never incorporated as a municipality. Fairfax District, an industrial area along the Missouri River. Maywood, until the late 90s a quiet, isolated residential area, now part of the "Village West" project that includes the upscale, sprawling "Legends" shopping and entertainment district, "Sporting Kansas City's" Sporting Park soccer stadium, "T-Bones'" Community America baseball park, "Schlitterbahn" amusement water park, "Kansas Speedway" NASCAR track and "Hollywood Casino". Pomeroy, late 19th century-early 20th century Train Depot, Trading Post, Saw Mill, and river landing for barges to load-unload. Rosedale. Rosedale merged with Kansas City in 1922. Turner, community around the Wyandotte-Johnson County border to the Kansas River north-south, and from I-635 to I-435 east-west. Wyandotte County Museum and Historical Society, located inside Wyandotte County Park. Kansas City is situated in "Tornado Alley", a broad region where cold air from the Rocky Mountains and Canada collides with warm air from the Gulf of Mexico, leading to the formation of powerful storms. The most recent tornado to strike Kansas City was in May 2003. The region is also prone to ice storms, such as the 2002 ice storm during which hundreds of thousands lost power for days and (in some cases) weeks. The low-lying areas near the confluence of the Missouri and Kansas rivers has been subject to flooding, including the Great Flood of 1993 and the Great Flood of 1951. Notes: Dew point is a humidity measure in degrees Fahrenheit. As of the census of 2010, there were 145,786 people, 53,925 households, and 35,112 families residing in the city. The population density was 1,168.1 inhabitants per square mile (451.0 /km2). There were 61,969 housing units at an average density of 496.5 per square mile (191.7 /km2). The racial makeup of the city was 52.2% White, 26.8% African American, 0.8% Native American, 2.7% Asian (Hmong 32%, Burmese 13%, Laotian 11%, Asian Indian 9%, Chinese 7%, Filipino 6%, Vietnamese 6% accounted for the majority of the total Asian Population), 0.1% Pacific Islander, 13.6% from other races, and 3.8% from two or more races. Hispanic or Latino of any race were 27.8% of the population. Non-Hispanic Whites were 40.2% of the population in 2010, down from 76.3% in 1970. There were 53,925 households of which 37.0% had children under the age of 18 living with them, 39.1% were married couples living together, 18.9% had a female householder with no husband present, 7.0% had a male householder with no wife present, and 34.9% were non-families. 28.8% of all households were made up of individuals and 8.9% had someone living alone who was 65 years of age or older. The average household size was 2.68 and the average family size was 3.32. The median age in the city was 32.5 years. 28.4% of residents were under the age of 18; 9.7% were between the ages of 18 and 24; 27.7% were from 25 to 44; 23.7% were from 45 to 64; and 10.5% were 65 years of age or older. The gender makeup of the city was 49.4% male and 50.6% female. As of the census of 2000, there were 146,866 people, 55,500 households, and 36,241 families residing in the city. The population density was 1,181.9 people per square mile (456.3/km²). There were 61,446 housing units at an average density of 494.5 per square mile (190.9/km²). The racial makeup of the city was 55.7% White, 30.12% African American, 0.75% Native American, 1.72% Asian, 0.04% Pacific Islander, 8.61% from other races, and 2.99% from two or more races. Hispanic or Latino of any race were 16.78% of the population. There were 55,500 households out of which 32.5% had children under the age of 18 living with them, 41.2% were married couples living together, 18.2% had a female householder with no husband present, and 34.7% were non-families. 29.2% of all households were made up of individuals and 9.9% had someone living alone who was 65 years of age or older. The average household size was 2.62 and the average family size was 3.25. In the city the population was spread out with 28.6% under the age of 18, 10.6% from 18 to 24, 29.5% from 25 to 44, 19.8% from 45 to 64, and 11.6% who were 65 years of age or older. The median age was 32 years. For every 100 females there were 95.6 males. For every 100 females age 18 and over, there were 91.7 males. As of 2000 the median income for a household in the city was $33,011, and the median income for a family was $39,491. Males had a median income of $30,992 versus $24,543 for females. The per capita income for the city was $15,737. About 13.0% of families and 17.1% of the population were below the poverty line, including 23.8% of those under age 18 and 11.5% of those age 65 or over. Federal Bureau of Labor Statistics shows employment in Wyandotte County, Kansas increased 4% from March 2011 to March 2012. The sharp rise in the number of people going to work puts Wyandotte County number 19th in the nation and 1st in the Kansas City metro for job growth as of September 28, 2012. Kansas City, Kansas is the home to the General Motors Fairfax Assembly Plant, which manufactures the Chevrolet Malibu and the Buick LaCrosse. The Federal Bureau of Prisons North Central Region Office is in Kansas City, Kansas. In addition Associated Wholesale Grocers and Kansas City Steak Company are based within the city. The largest employer is the University of Kansas Hospital. The adjoining University of Kansas Medical Center, including the schools of medicine, nursing, and allied health, is also among the city's largest employers (the student population is about 3,000). Village West, located at the intersection of Interstates 70 and 435. Anchored by the Kansas Speedway, tenants include Hollywood Casino, The Legends At Village West, Cabela's, Nebraska Furniture Mart, Great Wolf Lodge, CommunityAmerica Ballpark, home to the Kansas City T-Bones of the American Association, and Sporting Park, home of Sporting Kansas City of Major League Soccer. Schlitterbahn Vacation Village, a 370-acre (1.50 km2) resort and waterpark, opened across I-435 from Village West in June 2009. An Online Trading Academy center is also located in Kansas. Kansas City was ranked the #7 best city in the U.S. to start over after foreclosure. Average rent in Kansas City is only $788, which is low in relation to the national average of $1087 spent on rent. On March 30, 2011, Google announced that Kansas City had been selected as the site of an experimental fiber-optic network that Google will build at no cost to the city. Kansas City was chosen from a field of 1,100 US communities that had applied for the network. Google plans to have the network in operation by 2012. Piper, Kansas became the first full community in the nation (based off actual residential votes and pre-registration counts) to have residential broadband internet network infrastructures using fiber-optic communication of 1Gbit/sec download and upload speeds provided by Google Fiber. Kansas City, Kansas is also home to a library system, with 5 branch libraries spread throughout Wyandotte County. These include the Main Library, South Branch Library, Turner Community Library, West Wyandotte Library and in Wyandotte County Lake Park, the Mr. & Mrs. F.L. Schlagle Library. Kansas City, Kansas has a consolidated city-county government in which the city and county have been merged into one jurisdiction. As such, it is simultaneously a city, which is a municipal corporation; and a county, which is an administrative division of a state. The Kansas Legislature passed enabling legislation in 1997 and voters approved the consolidation proposal the same year. The Kansas City, Kansas Police Department was founded in 1898. In 1914. By 1918, it was taking photographs and fingerprints of all the felons it arrested. The Kansas City, Kansas Fire Department was founded on December 25, 1883. The fire department is part of the Firefighter's Relief Association which was founded February 28, 1918. The department has 18 fire stations in the city. They cover an area of approximately 127 square miles. They also have specialty teams including heavy rescue, hazardous materials, foam team, water rescue, tactical medic, trench rescue, high angle/rope rescue, and technical urban search and rescue. The fire department has four public service programs. The programs are citizens assist program, fire prevention, safe place, and the smoke detector program. Of the statistics available in 2000 based on data collected by the FBI as part of its Uniform Crime Reporting Program, which represent from arrests made by State and local law enforcement agencies as reported to the FBI, there were a total of 696 incidents. K-7: A freeway linking Leavenworth County, Kansas, Wyandotte County, Kansas and Johnson County, Kansas. There are a number of buildings listed on the National Register of Historic Places. Kansas City, Kansas is home to the Roman Catholic Archdiocese of Kansas City in Kansas, which covers 12,500 square miles (32,000 km2) in eastern Kansas. Memorial Hall is a 3,500-seat indoor arena/auditorium located in downtown Kansas City, Kansas. The venue, which has a permanent stage, is used for public assemblies, concerts and sporting events. In 1887, John G. Braecklein constructed a Victorian home for John and Margaret Scroggs in the area of Strawberry Hill. It is a fine example of the Queen Anne Style architecture erected in Kansas City, Kansas. 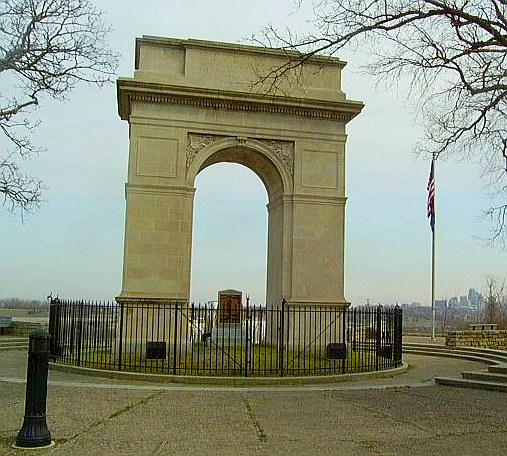 Rosedale arch, a replica of the Arc de Triomphe, at the top of memorial drive (39°3′49.8″N 94°36′54.2″W﻿ / ﻿39.063833, -94.615056﻿ (Rosedale arch)). Wyandotte High School is a notable public school building located at 2501 Minnesota Avenue. Built in 1936 as a Works Progress Administration project, the school was later designated as a Kansas City, Kansas Historic Landmark in 1985 and placed on the National Register of Historic Places on April 30, 1986. KPXE-TV 50 – Ion Television affiliate. Kansas City's Sporting Park hosts Sporting Kansas City of Major League Soccer. The city is home to one major professional sports team, Major League Soccer's Sporting Kansas City (known as the Wizards from 1996–2010). Additionally Kansas City is home to a minor league baseball club, the Kansas City T-Bones who play in the American Association. The Kansas Speedway is also located in the city. Kansas Speedway is an auto racetrack adjacent to the Village West area in western Wyandotte County, Kansas. The speedway, which is used by the NASCAR Sprint Cup series and other racing series, is a 1.5 miles (2.4 km) tri-oval with 15-degree banking in the turns. The track held its first race on June 2, 2001, when the Winston West series contested the Kansas 100. The top-level NASCAR Sprint Cup series holds the annual Hollywood Casino 400 at the track. The IZOD IndyCar Series previously had run the RoadRunner Turbo Indy 300 from 2001 to 2010; with IndyCar driver Scott Dixon setting the overall lap record for all series. The Kansas City T-Bones are a professional baseball team that moved to Kansas City, Kansas in 2003. The T-Bones were members of the Northern League, which is not affiliated with Major League Baseball, until the dissolution of the Northern League following the 2010 season. While the remaining Northern League teams entered the North American League as part of the Northern League's merger with the Golden Baseball League and United Baseball League, the T-Bones joined many former Northern League teams in the relatively new American Association of Independent Professional Baseball. From the 2003 season to the present, the T-Bones have played their home games at CommunityAmerica Ballpark, located adjacent to the Village West development in western Wyandotte County, Kansas. The T-Bones were the 2008 Northern League Champions. 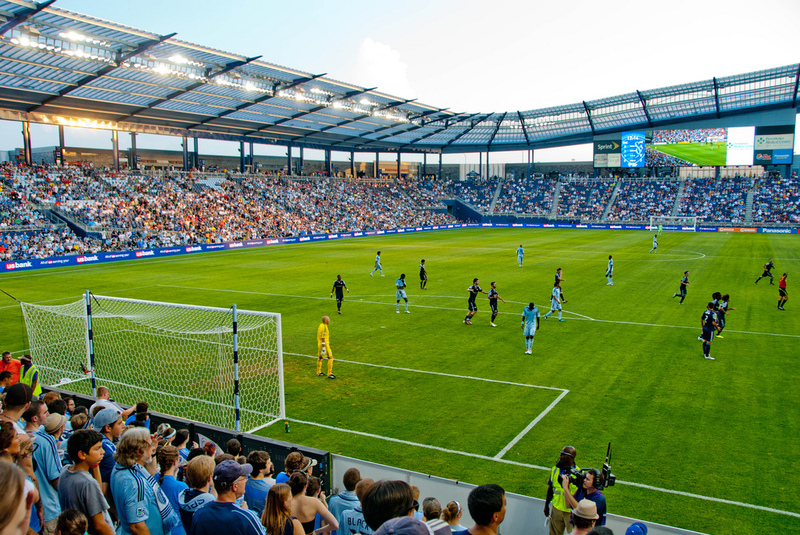 Sporting Kansas City is a Major League Soccer team that currently plays at Sporting Park. The team originally planned to move to a new stadium in Kansas City, Missouri in 2011, but the project fell through in 2009. The developer of the planned venue moved the project to the Village West area, near CommunityAmerica Ballpark, and received the needed approvals in January 2010. ^ a b "US Gazetteer files 2010". United States Census Bureau. http://www.census.gov/geo/www/gazetteer/files/Gaz_places_national.txt. Retrieved 2012-07-06. ^ a b "American FactFinder". United States Census Bureau. http://factfinder2.census.gov/faces/nav/jsf/pages/index.xhtml. Retrieved 2012-07-06. ^ "Population Estimates". United States Census Bureau. http://www.census.gov/popest/data/cities/totals/2012/SUB-EST2012.html. Retrieved 2013-05-29. ^ "2010 City Population and Housing Occupancy Status". U.S. Census Bureau. http://factfinder2.census.gov/faces/tableservices/jsf/pages/productview.xhtml?pid=DEC_10_PL_GCTPL2.ST13&prodType=table. Retrieved March 6, 2011. ^ KC powerless as icy barrage pummels the area, leaves behind disaster zone, Retrieved September 10, 2006. ^ "National Weather Service Forcast Office - NOWData - NOAA Online Weather Data". National Oceanic and Atmospheric Administration (NOAA). http://www.nws.noaa.gov/climate/xmacis.php?wfo=eax. Retrieved 2013-10-27. ^ "Kansas City (city), Kansas". State & County QuickFacts. U.S. Census Bureau. http://quickfacts.census.gov/qfd/states/20/2036000.html. ^ "Kansas - Race and Hispanic Origin for Selected Cities and Other Places: Earliest Census to 1990". U.S. Census Bureau. http://www.census.gov/population/www/documentation/twps0076/twps0076.html. ^ "North Central Region Office." Federal Bureau of Prisons. Retrieved on January 1, 2010. ^ Home | Hollywood Casino at Kansas Speedway. Hollywoodcasinokansas.com. Retrieved May 5, 2012. ^ "Online Trading Academy Locations". http://www.tradingacademy.com/Locations.aspx#list_of_locations. Retrieved March 3, 2012. ^ "A Deccent Place to Get Back On Your Feet". http://economy.kansascity.com/?q=node/4459. Retrieved October 28, 2010. ^ Official Google Blog: Ultra high-speed broadband is coming to Kansas City, Kansas. Googleblog.blogspot.com. Retrieved May 5, 2012. ^ "Google Fiber". Fiber.google.com. https://fiber.google.com/about/. Retrieved 2013-07-10. ^ Unified Government of Wyandotte County/ Kansas City, Kansas CAFR. (PDF). Retrieved May 5, 2012. ^ crime county. Fedstats.gov (April 20, 2007). Retrieved April 5, 2012. ^ carnegie. Skyways.lib.ks.us (July 20, 1914). Retrieved April 5, 2012. ^ Fire Station No. 9, Kansas_City, Kansas. Archiplanet.org. Retrieved May 5, 2012. ^ image FS9-firemen. Chwconline.com. Retrieved May 5, 2012. ^ theatres ks. Agilitynut.com. Retrieved May 5, 2012. ^ The Educational Value of Quindaro Townsite in the 21st century. (PDF). Retrieved May 5, 2012. ^ Quindaro Townsite Artifacts Find a Permanent Home at KSHS. (PDF). Retrieved May 5, 2012. ^ Front Page. www.kansascity.com (July 17, 1981). Retrieved April 5, 2012. Wikivoyage has a travel guide for Kansas City, Kansas. "Kansas City, a city and county-seat of Wyandotte co., Kan.". Collier's New Encyclopedia. 1921. "Kansas City. The largest and most important city of Kansas". New International Encyclopedia. 1905. This page uses content from the English language Wikipedia. The original content was at Kansas City, Kansas. The list of authors can be seen in the page history. As with this Familypedia wiki, the content of Wikipedia is available under the Creative Commons License.